This page details how motorists should overtake cyclists according to the Highway Code. Some drivers will try to take a shallow line around the cyclist when overtaking, often giving less than a metres gap between the cyclist and the car. If all motorists knew and understood the Highway Code they would know why they should wait until there was sufficient room to overtake safely and they would hopefully not get as annoyed by it. They would also realise that if they are to overtake on the other side of the road, there is no reason why cyclists cannot ride in the middle of their lane or ride two abreast as you can easily fit another cyclist in between the cyclist and car in the right hand picture (see Cyclist Two Abreast for more details). The DirectGov website states it's recommended for a cyclist to ride well clear of the kerb - 1 metre away or in the centre of the left lane (http://www.direct.gov.uk/en/TravelAndTransport/Cycling/DG_10026401). 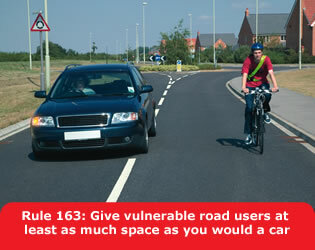 The second point in Rule 162 is also very important, cars should only try and overtake if there is sufficient room in front of the cyclist, this means that if there is stationary or slow moving traffic ahead there would be little value in overtaking the cyclist only to have to put the brakes on right in front of them. Also, if the motorist is going to turn left very soon after overtaking, it would be better to wait behind the cyclist instead of overtaking and then cutting left in front of the cyclist. Both of those scenarios actually save very little time for the driver if the overtake is performed but is very dangerous for the cyclist. There are some more points in the Highway Code which give guidance to motorists regarding cyclists and other vulnerable road users (http://www.direct.gov.uk/en/TravelAndTransport/Highwaycode/DG_069858) which I have listed below. Points 212 and 213 are particularly relevant to overtaking and tells motorists to not only give cyclists the space as shown above but also showing some regard for what they may do such as pull out to avoid a pot hole. If the motorist has not left enough room, this will be very important as when a car is passing a cyclist very closely, it restricts the ability to avoid obstacles on the side of the road and can force them into very dirty parts of the road which contain glass, flint and other items which will puncture a bicycle tyre. In summary, motorists should wait until there is space for them to overtake while giving the cyclist the appropriate amount of room, they should not try and force an overtake when another car is coming so that they have to pass closer to the cyclist than the room they would normally give another car. They should also take care when passing cyclists as well as other vulnerable road users. These are all according to the Highway Code. i must say as a point on this, as a non driving cyclist, this is how i understand that rule. give motorcyclists, cyclists and horse riders at least as much room as you would when overtaking a car. that doesn't state the other side of the road, the image is used to emphasise the point only. a car does not leave a full lane between it and another car. it leaves a few feet, a car doors width. if cars left this much space between each other you would not be able to overtake, roads are not 3 lanes wide. if a cyclist is not confident enough being overtake in this way they should not be on the road, the same way a driver not confident in driving should not be on the road. This shows the wording of the rule is too ambiguous as it is. It could mean what you say, but the picture implies that you should imagine the cyclist takes up the same space as a car. Some people read it as you do and then overtake a cyclist leaving a couple of feet (sometimes a lot less), which is not enough room if the cyclist hits pothole or swerves to avoid one, or is hit by a sudden gust of wind, etc. European regulations say to give 1.5m of space when overtaking a cyclist outside a city, 1m in the city - presumably the difference is to do with speed as any sudden changes of direction will be less severe at slower speeds. Absolutely agree, I've almost been hit by a car doing exactly what the picture shows. Very dangerous. I should have explained I was on the other side with the car charging towards me on the wrong side of the road. @caesar i cant see why you would need to swerve to avoid potholes or hit them. if you are paying attention to the road you should see it with plenty of time to adjust you line to avoid it. and again back to my first point, if you are not confident with cars overtaking you (i know the country roads around my area are barely wide enough for 1 car as it is) then you shouldnt be on the road. referring to the page on overtaking about riding being social. surely this is taking your attention away from the road (maybe this is why you would hit a pothole or have to suddenly swerve to avoid?) You don't see motorcyclists riding two abreast or conversing in the same way i frequently see other cyclists doing (turning to look at each other). again motorcyclists have a social aspect to their rides but they use radio mics in the helmets so as not to draw their attention from the road ahead, and so they do not have to ride next to each other. Even paying full attention to the road it is possible to be surprised by a pothole, a depression, hydrant cover, etc, especially in the rain or at night, even with very bright lighting. Even with car headlights, in fact. As well as problems with the road surface, the wind can be a problem, as can ice or oil on the road, and I have had to brake and swerve to avoid a fox on one occasion, and rabbits and squirrels a number of times. I would class myself as very confident at riding in traffic, having commuted in London for 10 years and having competed in road races and time trials on dual carriageways. My current commute is 35 miles each way from rural Surrey into the City, so I am used to riding in town and country, and used to being overtaken hundreds of times a day. Even so, I do not enjoy being overtaken at speed by drivers giving me a few inches clearance. Fortunately, the majority of drivers are considerate and don't do this. I don't think there is much difference between between using a radio mic and using your voice in terms of distraction. If you are riding in a proper tight group and not paying enough attention, someone else in the group will give you a right bollocking. As a car driver and an ex large vehicle driver, I give cyclists as much room as I safely can, I hate filling out accident reports. What is needed more than the current state of play of those in car moaning about cyclists and motorcyclist and vice versa, is we ALL need to moan at councils to repair the roads so ANY road user doesn't have to change course due to pot holes. Show a united front. Cycle much at night? Then if you do I would imagine it's easy to see why people may need to swerve suddenly to avoid the potholes! im a regular commuter to work on my bike and on a daily basis i am cut up this way by vehicles car motorists need more education on this rule i drive in my regular job as well as at home . Totally understand this.Just wondering where the "Nicked" law when it comes to horses on the road? Cyclists and Motorists are both to blame (not all obviously). I grew up with the the common-sense to look out for ALL road users. Ain't too apparent these days. you obviously have never cycled on the road so you don't appreciate that potholes and things like shattered glass etc very often cannot be seen until you're just meters from them. Why do you think road humps are painted if it is not to make them obvious to road users who travel at speed? Try cycling on the road first before you give your opion and then your opion will change. I cycle to work almost every day because it's quicker and yes I do drive I've got three cars ?? Cars need to give cyclists the same room as they would overtaking another car??? Do cyclist have to do the same when undertaking cars in traffic? No. They just weave in and out of traffic, jumping kerbs to beat red lights. Everyone is entitled to cycle on the roads but the cyclists think they have a god given right to be there. They should pay road tax. Cyclist moaning about cars yet cars pay for the damn roads. Yes, you should give cyclists the same room as you would when overtaking a car, it specifically states so in the Highway Code and is to try to mitigate the risk of hitting a cyclist with your car and killing them. The difference when cyclists filter (that's the actual term for it, it's legal and accepted practice for bikes and motorbikes) through traffic is that they're the ones in control and the speed difference is a lot smaller. If they hit a car, they're only putting themselves at risk so it's their choice as to whether the risk of getting hit outweighs the reward of moving up in traffic, when divers overtake dangerously, the only risk they have is hitting the cyclist, not injuring themselves, they're putting someone else's life at risk, it's a big difference. Cyclists shouldn't jump up and down kerbs and jump red lights, I don't do either. But, even if they do, it's no excuse to put their lives at risk, it doesn't justify it, as much as it annoys everyone else and is illeagal, nothing gives you the right to put someone else's life at risk to save you a few seconds on your journey. As for road tax, that's not what you pay, you pay vehicle excise duty based on the emissions of your car. Firstly that doesn't pay for "the damn roads", it goes into the big general taxation pot along with income tax etc, council tax is mostly used to pay for roads. Secondly, if they were included in the duty, the emissions of a bike are 0 so they would not have to pay any, think of them like greener versions of electric cars which pay 0 tax. You are right, everyone is entitled to cycle on the road, without fear of getting hit by a car I might add, please don't think as a driver you are any more entitled than a cyclist. I agree with Vita above. This blog post is incorrect. The rule quite clearly states "give motorcyclists, cyclists and horse riders at least as much room as you would when overtaking a car". When overtaking in the car, you're in the next lane, usually less than a metre away. Of course, you can try to give more space, as the rule recommends, but it's perfectly legal to overtake a cyclist with less than a metre of space. Furthermore, I'd like to see a similar blog post for cyclists, paying particular attention to the rule "only overtake on the left if the vehicle in front is signalling to turn right, and there is room to do so". The rule is anything but clear, hence this discussion. Do you really think it was intended to mean you should give horses less than a metre? You are correct that it is legal to give less than a metre of space, this is a "should" not a "must" in the Highway Code. There's a specific set of guidelines for horses under rule 215 (https://www.gov.uk/road-users-requiring-extra-care-204-to-225/other-road-users-214-to-218), indicating you should pass wide & slowly while treating them as a potential hazard. While I never endanger or scare cyclists & I always give them plenty of room when I overtake, more than I would give a car for instance, I find I get far less respect from cyclists when they brush past my vehicle and weave in & out of traffic (the same people are often crossing solid white lines at traffic lights, using pavements, etc). My biggest bugbear though is getting stuck behind slow cyclists when there's no opportunity to overtake safely, resulting in lots of traffic & irate motorists. Surely if they're following the same highway code then rule 169 should come into effect and they should allow the vehicles to pass? Yep, and 212 & 213 say to give cyclists plenty of room. Cyclists breaking the rules annoy other cyclists too, partly because for some reason we are all grouped together as a fraternity or something, and so those of us who obey the rules suffer from the negativity produced by the others. Thank you for not falling into that trap and giving enough room. However, surely you can see the difference between overtaking someone on a bike too closely in a 2 tonne box of metal and someone weaving in and out of slow moving or stationary traffic? Why do you think the latter is disrespectful? If they are careless and actually hit your car, or are causing drivers to have to brake or avoid them then I can understand that but not just if they are getting through traffic. Your final point seems to contradict your previous one. You think it is disrespectful for cyclists to try not to be held up in traffic jams, but it's not disrespectful for you to want them to get out of the way when you don't want to be held up in traffic? Anyway, I agree that people should move over if they are causing an obstruction as you describe, although I would think in the majority of cases, the time actually spent being held up by a cyclist will be far less than that lost in traffic, and will make little difference to the overall journey time. There are a lot of cyclists on the lanes and hills where I live and when driving I always wait until I can give a lot of clearance when I overtake. I almost always end up behind the same car who was in front of me before the overtake, even if they were a lot less patient. When a cyclist is moving within inches of cars, considering things like earlier comment: "Even paying full attention to the road it is possible to be surprised by a pothole, a depression, hydrant cover, etc", I find it is disrepectful as they run the risk of inadvertantly scratching my vehicle. In addition to this, some cyclists don't adhere to the highways laws with regards to overtaking and can be seen veering over solid white lines and ignoring road laws to do so. Why wuldn't I find that offensive? I fail to see where I said I don't like cyclists to get past me, I said I don't like the manner in which they usually do so (leaving little to no room, cutting in, weaving from the left side of the lane to the right & back again several times in a short distance). One major difference here is that traffic caused by congestion cannot be avoided easily and is not an infraction of the highway code, whereas traffic caused by a slow moving vehicle can and is. If they're moving within inches of cars then I would expect that they and the cars will be going very slowly so bad road surfaces are less of a problem - there is more time to see them and it is less of a problem if you ride over them slowly. Still, people certainly shouldn't touch your car or cause you to brake or have to move to avoid them though, I completely understand why that would be seen as disrespectful and annoying. Similarly, crossing solid white lines and riding on the pavement is illegal and there is no excuse for it. I think when the law say "should" you need to use common sense. You have to asses the risk of passing a cyclist or horse less than the recommended distance and make a decision based on that. You should be also aware that if cyclist/horse moves off from their straight path and you hit them (talking about close overtaking) then it will most likely to be the drivers fault on the court. You personally need to weigh up what's more important: reaching your destination x minutes faster (not sure what was the maximum time a cyclist ever hold you up, I would be surprised if it's more than 30-60sec) or causing death/serious injury. I choose to wait. Overtaking from the left is an interesting question: I don't believe that the law was intended for pushbike users. In busy cities like London the infrastructure for cyclist designed to pass on the left hand side of the traffic. What point and why should the cyclist stop, cross over to the other side of the traffic to see if a car ahead is turning right, then returning to the left to carry out the pass. This is also dangerous as at junctions drivers can give way to traffic crossing their path. It is very common to be taken out by cars turning across of the flow from opposite direction. Not sure why you want to see an article about it but feel free to write one so we can have a healthy debate about it. I think the critical point to draw out here is that motorists should appreciate that this is an 'overtaking manoevre'. If they do, they will check that there is space ahead, check they can see round the corner, give enough space, etc. Mostly, they don't think of it as such, and fail on one or all of the counts. Especially out here in the countryside, the failure to check that there is nothing coming round the corner results in cars cutting in front of bikes to avoid the likely collision with the oncoming vehicle, so pushing you into the gutter/off the road/into the hedge, etc. ooo I just love stuff like this that make sweeping generalisations of motorists. I often come across idiot cyclists who do bloody dangerous stuff but imagine the uproar if I posted about it wording it like it was all or most cyclists. Fair enough, perhaps the author should change "Most drivers" to "some drivers" at the start. The sweeping generalisations thing is more common the other way around though. Read the comments section on the Daily Mail when there is a cycling article and you'll see lots of highly rated comments saying things like "when cyclists stop running red lights then they can expect respect on the road". Most cyclists are also drivers which makes them less likely to generalise, and some of the generalisations of drivers are reductio ad absurdams intended to show the stupidity of the generalisations about cyclists. Yep, that is fair enough, I've amended as such. It's not all motorists, not even the majority so "most" was the wrong word. I do agree that there is an uproar when cyclists are generalised, as it happens all the time, so I understand that it's not on. Can we have a blog article about cyclists needing to understand traffic signals such as red lights as well please? Sure, why not write one? If you read the comments on this and the other articles you'llsee that practically all of the cyclists are against it and think that people that do it are irresponsible and cause more problems and danger for cyclists that do obey the rules. I am all for encouraging cyclists onto the roads. The benefits to health and environment are obvious. However, I note that the vast majority of comments are about the rights of the cyclists and how motorists are fully responsible for the safety of the cyclists. Surely, it is time for cyclists to also take some responsibility and there should be a legal requirement i.e. they have to pass a competency test, including an understanding of the Highway Code. They have to be licensed, even if it is for free. They have to wear visual clothing. They have to have front and rear lights at night (in fact these should be on at all times to help visualisation). They have to wear a crash helmet. They have to have a rear view mirror, so that they are aware of traffic behind. They have to have an audible warning device, in particular to to warn pedestrians of their presence. This is particularly relevant, when cyclists want to go hurtling down public paths and walkways at top speed. Perhaps when this is in place, then motorist will be a lot more in tune with cyclists. I think you miss the point, when you overtake a cyclist, it's your responsibility to do it safely, to make sure it's safe to do so, if it's not, don't do it, wait until it is. All of the other stuff is just your opinion (which you're obviously entitled to) but don't let that get in the way of the fact that when drivers overtake cyclists in their cars, it is their responsibility to do so safely. When cyclists are no longer hit by cars and lorries which account for the majority of accidents, cyclists may then look at things like your suggestions to address the remaining causes. The only cyclists I'm aware of who jump Red lights also jump red lights when driving there cars. On my daily 10 minute walk to work each day regularly count more than 9 cars jumping red light and zero cyclists. Can we have a blog article on drivers needing to understand traffic signals? For what it is worth, my opinion is this, some cars simply do not give cyclists enough room. I cycle to work most mornings, and a fairly large part of my cycle to work is down a two lane, one way street. The number of times i am cycling in the left lane, and I have been passed by a car within mere inches (or have been clipped a by a wing mirror) despite the fact that they have a completely empty lane to their right is unbelievable. For my part if a car is within an arms length of my bike they are too close. I would urge any driver to consider one thing - how would they feel if they, or one of their children/family, were on a bike and someone passed that close to them, or worse caused them to have an accident as a result of passing too close. Sounds like this is somewhere you should ride in primary position, i.e. "take the lane" to prevent cars doing this. Your final point is one of the reasons cycling becomes safer the more cyclists there are. Most cyclist are indeed car drivers as well and can understand what both sides have to say. I would like to see the "some" car ONLY drivers with their negative comments about "some cyclist" to ride a bike. You can only make an honest and informed comment if you know what it feels like. Just out of interest when was the last time a vehicle driver was killed by being crashed into by a human being on a bicycle? Further to my comment earlier I now sadly have to add this. I have just avoided getting moan down by another cyclist on the footway at speed, this one gets the double idiot award for leaving the footway to cycle through a red light on a pedestrian crossing to then mount the path again almost taking out a mother and child, then continuing his merry way along the footpath at speed. The drivers of the 4 cars on the road, that had stopped at the red light looked on with a shocked face, and 1 even asked if everyone was ok. This would just lead to more road rage as cars would be stuck behind the cyclist for far longer waiting for a suitable gap. Most roads are wide enough to accomodate a car overtaking a cyclist whilst avoiding oncoming traffic. Great comments about stuff not related to the topic i.e I saw a cyclist do that I saw a motorist do that, reminds me of when I was 12, luckilly none of us adopt this attitude when we drive. Simple just overtake carefully, don't risk harm no matter how stupid the person you're overtaking is behaving, adopt a mature attitude as we're talking about being held up for a few seconds. The funny thing is that it's more likely you're going to get held up for far longer by other cars, but somehow that doesn't bother folk. Therefore if being held up for 30 seconds by a bike annoys you, but being held up by the 'comedy caravan' or road works doesn't it suggests you have an issue with riders of cycles and that in my opinion makes for a very very dangerous motorists. Overtaking is so simple, there's a way of doing it right that any competent driver can manage. As a point of interest... why don't bicyclist have mirrors? They're useful for seeing what's behind and act as an occasional reminder that the individual is dawdling about on a road, with an assortment of very heavy objects piloted with varying degrees of suicidal incompetence. The problem with this, and every other law in favour of cyclists is that, whereas the car driver, motorcyclist etc is required to pass a rigorous testing process, the cyclist does not - and can, with no other qualification save to negotiate a set of plastic cones at primary school, take to the road on something approximating an upgraded clothes-horse on pram wheels. They don't know what's around them, what's behind them, and believe it is acceptable behaviour to cause tailbacks while they dither about at 5 mph yacking to their buddy. They are as reckless and unaware entering the road from the pavement, and suddenly sweeping across the lane after remembering they live up that side street they passed 5 seconds ago, as they are deluded into thinking that, the apparent absence of any legal requirement to equip a peddle-propelled clothes-horse with a mirror will render themselves immune to the earthly laws of physics, common sense and the Universal Law of English Courtesy that every other poor sod has to adhere to in order to stay alive long enough to get home. Maybe if they had a mirror they would perhaps heel-over therefore creating a mutually agreeable arrangement. Of course... this does not apply to everyone, cycles or motorist. It only applies to the stupid ones in both camps; of whom, there are many and they appear to be in the majority. Motorists can pass their test and use the ensuing years on the open road to really hone their incompetence and discourtesy skills. This articular law which requires the motorist to enter the oncoming lane in order to overtake just gives them the excuse to risk head-on collision with opposing traffic... which happens... every day... every time there is a bicycle on the road. Because they are imbeciles and no by-law, statute, threat of death or appeal to their innate sense of fairness and consideration for their fellow man/woman et al.. will penetrate that thick skull all the way to the pea-sized kernel that functions as a nervous system. What we should be doing is prosecuting stupidity. Not making laws that just allow the stupid to legitimise their stupidity. This was brought to you by a motorist who is constantly confronted by motorists head-on, while they overtake cyclists in the on-coming lane. Some cyclists have mirrors, most don't though. I think the idea is that you can hear what's going on behind you pretty easily (provided you don't have music at full volume!) so can look round when safe to see what's going on. I don't really agree with your opinion on the actual problem, there are plenty of people who cycle very considerately and plenty of motorists who have passed their test who do not. I do agree that it's not all motorists and not all cyclists, my point on this is that motorists behaving badly are a lot more dangerous than cyclists behaving badly, you point out a lot of stupid things that cyclists do but there are a whole host more that car drivers do, which not only put themselves in danger but others too. Where is this Universal Law of English Courtesy written? I'd love a read, but I presume the guys sitting in the middle lane on motorways, talking on their phones, jumping lights, cutting people up to get ahead, pulling out of side roads and all the other things I see when I drive to work haven't read it either. I don't think a mirror on a bike would solve this. This rule about overtaking cyclists (163) isn't giving anyone the excuse to risk head-on collision, it should be used in conjunction with the previous one (162) which states that you should only overtake if the road ahead is clear and there is a suitable gap. If there is a risk of a head-on collision, the driver should not attempt an overtake, they should wait until it's safe all round. It's not hard to wait, it may be frustrating but worth it to avoid either hitting a person on a bike or a person in another car, it should really be that simple. I think the real problem is that drivers feel it's their right to get from A to B in the quickest time possible and that anything in their way should be overtaken as quickly as possible, but that's just my opinion. You are slightly wrong however, motorists don't have the right to drive on the road, they are licensed to do so (hence driving licence), everyone has the right to cycle on the road, it does not have to be earned. I do think that more training in schools is a good idea though, I don't see why it's not compulsory whereas swimming is. Also, worth pointing out that 90% of British Cycling members also ave a driving license so most of them have actually passed their driving test, they just ride a bike instead sometimes. If a person is simply cycling along, minding their own business and a car driver overtakes in a stupid place, you cannot blame the cyclist for being there, they have every right to get from A to B on their bike. You can blame either the driver for not waiting until it was safe or the council for not creating an infrastructure where cyclists and cars can occupy the same roads without conflict. This is brought to you by someone you who drives and cyclists and see's stupid actions from stupid people, sometimes on bikes, sometimes in cars. As a cyclist I'm often confronted with motorists overtaking in frankly suicidal ways. Oncoming motorists being forced to slow or swerve to avoid head on collisions!!! All as direct result of impatience. Its not the cyclists fault that the ever increasing quantity of oncoming traffic requires drivers to wait longer before an overtake can be carried out safely. Take that up with your fellow motorists!!! There is no reason why a vehicle shouldn't give a single cyclist at least a meter. I cycle occasionally (for fun mostly) and I do my best to tuck in, go fast, go slow or stop and pull in if I think I'm being a nuisance at times. What annoys me is the cycle groups who make no attempt to help vehicles get past. Where I live, there are often cycling groups going around, and on a regular basis when driving I find myself stuck behind very large clusters of cyclists on country roads, who usually take up the full left side of the road. Giving them a meter would be very difficult if not impossible. Only yesteday, I was stuck for five minutes behind a group who made no attempt to thin out. I think some cyclists are too pre-occupied timing themselves or sticking to a regime to care about other road users. Personally, I think there should be a rule about how many bicycles are allowed to group together, as they could potentially hold up people who have genuine emergencies. For every advert that we see telling drivers to look out for cyclists and make it easier for them, there should also be one that tells cyclists to do the same. I'm afraid I disagree with quite a lot of your points really, you may cycle for fun but some do it as a mode of transport, trying to get from A to B just like everyone else on the road so I'm not sure why they would need to pull in and think they're being a nuisance, they have as much right to get there on the road as car drivers and so do other cyclists regardless of their motives. You don't see cars pulling over for other cars which are clearly wanting to go faster, if anything people now slow down! You also don't really see lorries/horse boxes/caravans/etc pulling over much either. Obviously this depends on circumstance and on very narrow roads it with no chance of a safe overtake it's polite to pull over but if it's a case of the car having to wait 20 seconds, really they should wait. The issue normally comes out of the shortness of the time some drivers are willing to wait, if they think it's been too long, they'll just overtake anyway. Cycling groups are slightly different as they are generally out for but again they have every right to be on the road too, but they should be riding two abreast max making it easier for you to overtake (as per my other page). It's not that they are hogging the road, it's that they are on it and actually understand safe overtakes which you don't seem to, even though you say you would give a cyclist 1 metre as it should make no difference if they take the whole left lane as you should be on the right hand side overtaking, here are the numbers: you think cars should be around 1 metre away, with the bike being around 0.5 metres wide and the average car being around 1.9 metres wide it all adds up to a total width while overtaking of 4.4 metres. Average road lane widths are around 3.5 metres meaning a car overtaking a cyclists safely will be on the other side of the road and the car should wait until it's safe to do so. Riding two abreast does seem to force this issue, as does riding in the primary position when riding along. If there are emergency vehicles approaching, I'd assume a group of cyclists would get out of the way. Normal drivers with genuine emergencies are few and far between but should still be driving in accordance with the Highway Code, there's no need to put another person's life at risk just because you are in a hurry, for whatever reason, your life is of no more value than theirs. Again the point of other motorists not getting out of the way if you're in a hurry applies. You posted on the other page too but it's too full to show any more comments so I'll address it here, "The whole "drivers don't pay for roads" argument is rubbish as well. How many roads would actually get made if cars didn't exist? There wouldn't be many places left to cycle on if roads weren't being built to suit cars in the first place. ". Cars are currently taxed on emissions, if you like, bikes can be included in that as well but they would still not attract any VED as they don't produce any. It's such a stupid argument, do hybrid cars pay for the road? Plus, do you think the roads were made for cars? Which do you think came first, the bike or the car? If there were no more cars, we probably wouldn't need to build any more roads, we have more than enough for all of the bikes! question is the wearing a helmet and lights on at night situation by law for cyclists ??? Nights at night, yes. Helmets, no. The best way to change this motorist/cyclist problem is to implement a 1 metre minimum distance rule for when overtaking a cyclist using a motorised vehicle. If a 1 metre law was rigidly adhered too in the courts then drivers would very quickly "learn" to give a metre or more distance when overtaking cycles. The problem is that the laws are not upheld and adhered to and this must also be addressed. Would people use their mobiles whilst diving, if they knew there was a very high chance of getting caught and being fined at least £1000 and points being put on their licence? Of course some would, but not nearly as many as currently can be seen. It's the culture of selfishness and "everyone's doing it" attitude coupled with a tiny amount of prosecutions relative to the lawbreakers that have allowed a dangerous practice to become normalised for many otherwise law abiding citizens. Seemingly it simply isn't enough to have a law in place that isn't rigidly applied, neither is it enough for people to realise that what they are doing is illegal and potentially very dangerous, there has to be a very real and high chance of being punished for the act in order for people to stop doing it. The UK needs a culture change. Forget cyclists,motorists and pedestrians and think people using different modes of transport. People who endanger others though thoughtless actions can take any mode of transport but the reality is that a person driving a motor vehicle is far more likely to endanger other people than a person using another mode of transport. Therefore there should be a presumption (unless proved otherwise) that a driver of a motor vehicle is negligent when involved in a RTA with either a pedestrian or a person cycling, not because people who are walking or cycling don't ever cause accidents but because driving a vehicle requires a high level of responsibility especially to other road users due to the terrible repercussions of irresponsible driving. Find Vehicle Testing Stations in England, Scotland and Wales including addresses, contact numbers and test classes authorised. Great video and shows even the experts are wrong! The cycling group should not have been two abreast on such a narrow road so they are in the wrong. Then an advanced driver overtakes on a blind hill. If cyclists want space that's fine but they too MUST obey the rules. However the amount of space they are requesting is way too much and even overtaking another vehicle you don't have to leave that much room so cyclists stay as close to the curb as you safely can and don't weave all over the road. I don't think the experts are wrong, that's why they're called experts and I think it's slightly arrogant to assume your opinion is right and theirs is wrong. Cyclists should obey the rights but it's within the rules to cycle two abreast and as I have mentioned countless times, it's better and safer when cars try and overtake provided they do it properly. The Government guidelines do not state that cyclists should ride as close to the curb as you can, in fact they say ride well clear of the kerb - 1 metre away or in the centre of the left lane as mentioned about (did you get that far?). Please don't overtake cyclists dangerously just because you don't agree with them or the experts, it's not worth endangering lives over. Nope....It is you that is wrong. Take a little time to read the Highway Code. If you use a modicum of common sense, riding x2 abreast takes up a very similar space to that taken up by a vehicle. Yet if you have a single occupancy vehicle on a narrow road, do you have a go at them for taking up too much space and making an overtake difficult as have done with a group greater than four riders? IF they were to ride in single file, they'd form a long train which would be super dangerous if someone were to attempt to over take them in this configuration. Does that include cyclists coming the wrong way down a one way street and cyclists in dark clothing and no lights at night and cyclists ignoring red lights and cyclists ignoring cycle lane markings and cyclists using both hands to text on a mobile phone? Simply put, yes. Cyclists should follow one way signs, ride with lights in the dark, stop at red lights and not use a phone but even if they don't, you should still overtake them properly, it doesn't mean their lives are worth any less, just they're being very careless and stupid. Just because their doing something wrong, if you hit and kill them because you don't follow the proper rules, that'll be on you. Cyclists don't have to stick to cycle lanes too by the way, they are there to use if it's safer to do so, often they're not. I was driving on a narrow Lane that I drive on every day and nearly always have to overtake cyclists, they always move over and I pass easily by driving slowly on the grass verge, but today was a group of around 6 cyclists they all pulled into the middle of the lane so I couldn't overtake them, I found this very frustrating because they were holding me up and I had to be somewhere on time, are cyclists allowed to do this? As long as they were not more than x2 abreast, then, yes they're legally allowed. It's a fine line but if there are more then say 3 in length (whilst 2 abreast, so x6 in total) overtaking can be dangerous; if you have an oncoming vehicle, that forces the overtaker to move left quickly into the space already occupied by the cyclists. If the road ahead is clear, the cyclists should out of courtesy pull in a little and gesticulate that it is all good for you to pass but this requires skill and confidence. I think we are all missing the main point.Until cyclists are registered just like in other European Countries it will be mayhem and lawless.Cyclists have to behave and also use common sense for example if it is a long road with plenty of gaps they should let cars trawling behind them overtake safely and motor drivers should be able to report cyclists who do not conform or do dangerous maneuvers. Horse Transport - We provide best Cheap Horse Transport service, we are available 24/7 to provide our service. Just call us: 07908 597443.
oh i overtake all on my new bike from discount bikes haha, but i understand your article, pretty true what you say. Remember the highway code is a guide . If a point is enforceable by law it is highlighted in bold red text.The main point of rule 163 is be considerate to other road users. Recently drivers have been fined for overtaking a cyclist too closely. "If all motorists knew and understood the Highway Code they would know why they should wait until there was sufficient room to overtake safely and they would hopefully not get as annoyed by it." Clearly inflammatory, written from the point of view of the cyclist. In the interests of balance, then, may I say that I will happily give a cyclist the same amount of room as they give me in my car, when I'm waiting at a red traffic light, and they sail on up the nearside and continue on their way, oblivious to the traffic light, which incidentally applies to cyclists as well as motorists. IE I will give them 2 inches, and no more. Seems fair enough wouldn't you say? I'm a motorist too, I drive more than I cycle, I have just read the Highway Code sections about overtaking cyclists and been on the end of some pretty scary close passes. There would be no close passes if everyone has read and understood the rules and realised there are there to save lives, saving time isn't worth risking lives. And no to your other point, it's not equivalent at all, passing a car when it's stationary or slow moving is one thing, the only person at risk is the cyclist (and I tend not to pass traffic on the nearside) and the only real risk is if the car starts to move in which case the cyclist can stop and pull in, plus with the slow speed, the impact would be small. Passing a cyclist with inches to spare at speed is totally different, again the only person at risk is the cyclist but this time it's not their choice and the risk is a lot higher, higher speeds and impact plus they're not in control. If I swung a sledge hammer 2 inches from your face as fast as I could, do you think it's the same as passing your face past a stationary sledge hammer? If you let me do that, and you think it's the same, maybe it would be fair enough, wouldn't you say? Of course youre right .But we are missing the main point. It is diabolical to allow cyclists free rein on our main roads and the day will come when the archietect of this dangerous project will come to their senses.until every cyclist is registered with a number plate just like other places in Europe cyclists may be considered as lawless and reckless. Yes, I see your point about the scourge of the cyclist, it's like the person who invented them wasn't considering car drivers at all, crazy! Number plates definitely work for cars, none of them break any rules so I can see why people want them on bikes, just like these other European countries, I can't quite recall which ones mandate them though, do you know of a few good examples (Denmark and the Netherlands have lots of bikes and seem very safe, maybe they do)? Should slow moving road users pull over for other road users including cyclist to avoid obstructions? Cyclists should be insured and it should be law that a helmet is worn for their safely above all, plus a hivis jacket or sash which should have a number on it so they they can be contacted for any breaks of the Highway Code that they make. Going across crossings when people are crossing, often mowing into pedestrians, going through red lights. Being on the road https://www.nhsbsa.nhs.uk/exemption-certificates/medical-exemption-certificatesen there is cycle lane available etc. They should also be fined for not having lights in the dark. Once they are treated like other road users they will perhaps stop behaving like they can do as they please and be responsible and stop whinging at others. Im not sure when if ever it will be safe for cyclists on our roads regardless of driver education. To many vehicles in a rush to get somewhere & a low intolerance of other road users.